Today I managed to make some significant progress on the Bad Moon ork nob I’ve been working on. I have finished the metallic areas and managed to paint and weather the armour. 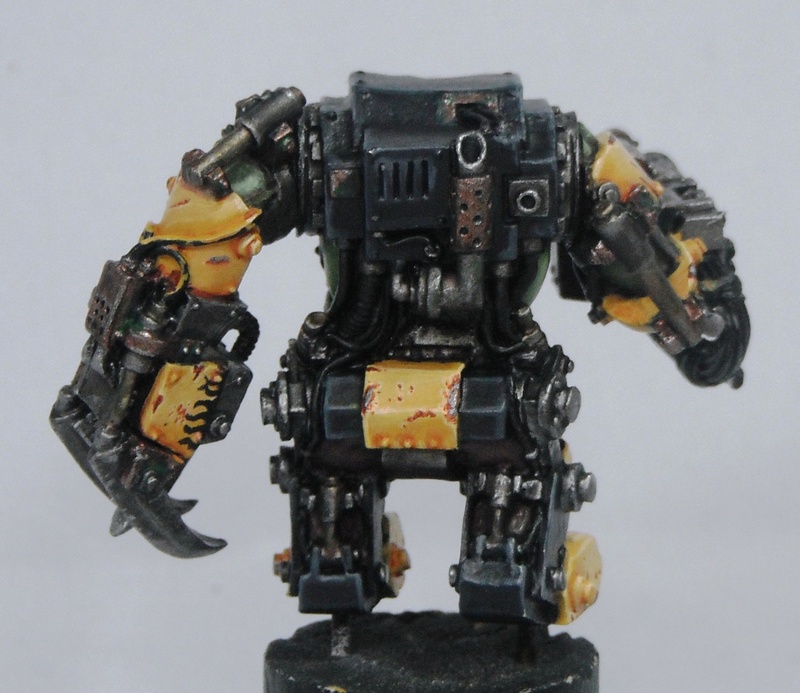 Because of the large areas of exposed metal on the model I decided to paint the metal in two colours: steel and brass. The steel areas were basecoated Boltgun Metal and washed with Badab Black followed by Devlan Mud. They were highlighted with Boltgun Metal followed by Mithril Silver. The brass areas were basecoated using an equal mix of Scorched Brown, Tin Bitz and Dwarf Bronze. This was also washed with Badab Black and was highlighted by adding Mithril Silver to the original mix. The recesses were washed with a 50/50 mix of Dark Angels Green and Hawk Turquoise before a final highlight of pure Mithril Silver was applied to the most prominent areas. 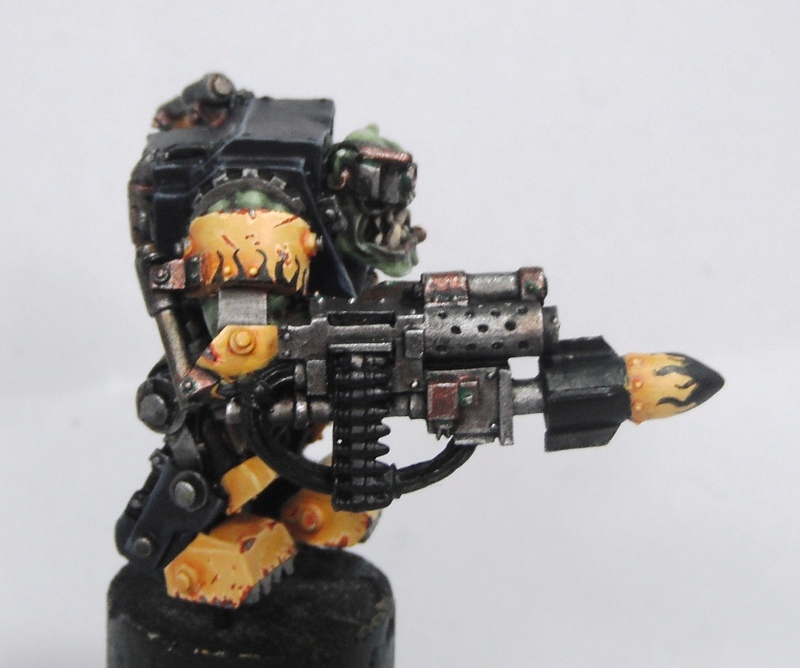 The pistons on the hydraulics were painted with Boltgun Metal but, unlike the other metallic areas, they were not washed with Badab Black and Devlan Mud. The reason for this is that I wanted them to look shiny and oily as they are moving parts and would have to be kept in good condition in order to function. If they looked rusty and corroded they wouldn’t look very realistic. To achieve an oily look I washed them with Gryphonne Sepia followed by a mix of Thrakka Green and Ogryn Flesh. I won’t go into how I painted the yellow here as I have taken some step-by-step photos and plan on adding a tutorial on how to paint yellow to the blog soon. The chips on the armour plates were painted using the same tromp l’oeil method I used on the cracks of the Bloody Reaver. This involved carefully painting on the chips and highlighting and shading them. In order to get chips that appeared to be different ages they were painted a variety of different colours. 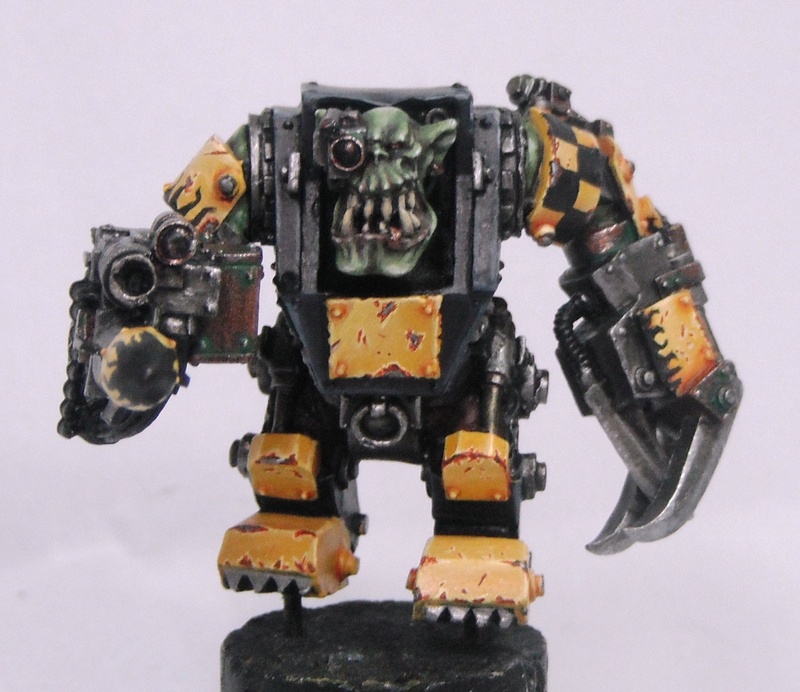 To begin with I painted the chips on using a mix of the yellow basecoat and Skull White. I then painted inside this with Dark Flesh. Some of the chips were then given a fine line of Scorched Brown to make them look even darker and older. Newer chips were painted by applying a small amount Boltgun Metal to the center of the chip. I also painted on some freehand designs in black. The black flames are a traditional Bad Moon motif and so I had to include those. 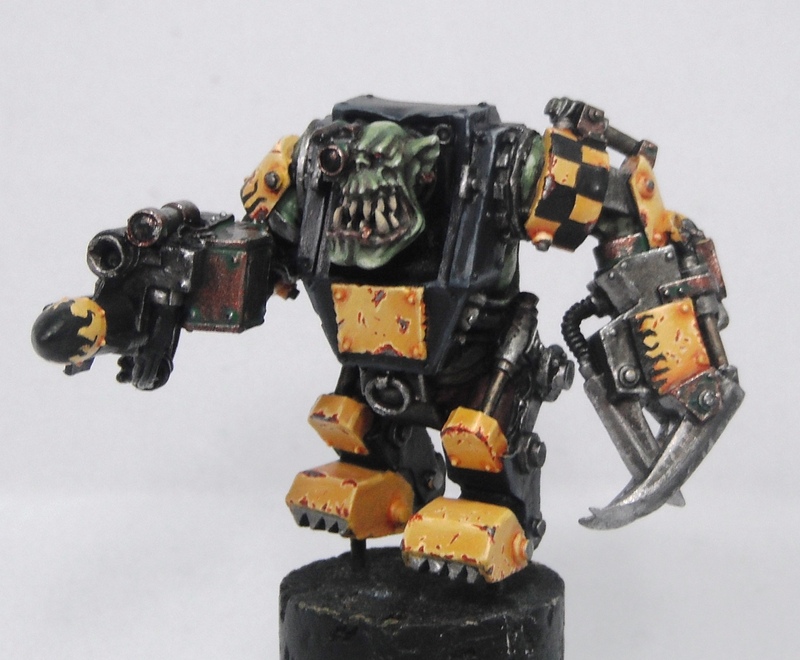 The checks on the shoulder were painted on in order to break up the large area of yellow on the model’s left and to help ‘balance out’ the colours more. All that remains now is to paint the details and create a base for him. 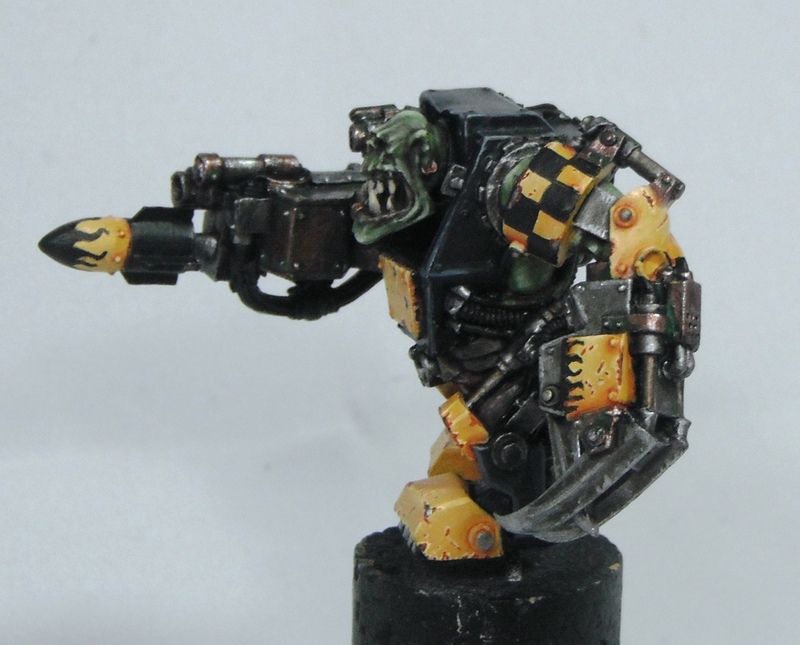 Bad Moon ork – finished!